The property at 2 Berkeley Hill is on the market for $1,299,000. Architect Frank Lloyd Wright is renowned for the hundreds of contemporary structures he built in the late 19th century and the first half of the 20th century, most in a distinctive combination of architecture and nature. So important were natural surroundings to his designs that Wright spelled the word "nature" with a capital N.
His creations -- including one in Stamford and another in New Canaan -- were "environments to inspire and offer repose to the inhabitants," according to the nonprofit Frank Lloyd Wright Foundation website. Wright's philosophy and designs inspired countless architects to replicate his work. 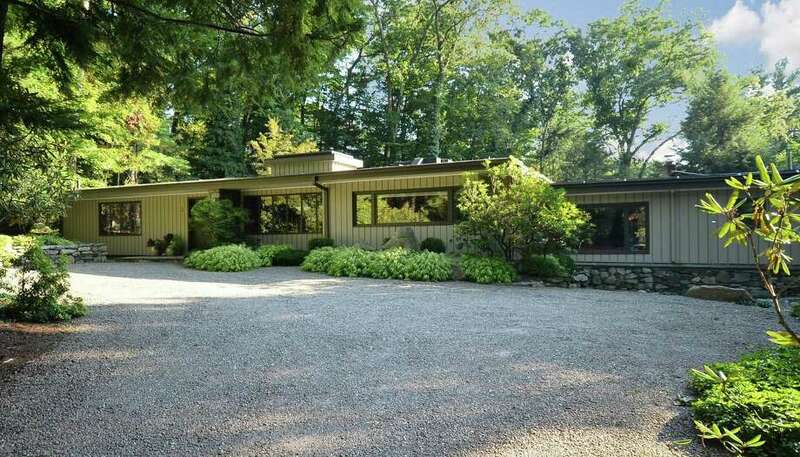 One such example is the Mid-Century Modern house at 2 Berkeley Hill. The Wright-inspired house sits on a one-acre tranquil and private wooded parcel on a quiet cul-de-sac. The 3,437-square-foot house was built in 1950, incorporating much stone work and glass that combine to invite the outdoors inside. In fact, there is a real interior garden in the floor of the sunken formal living room. Floor-to-ceiling glass walls in some rooms provide unobstructed views of the wooded property and its stone patios. The current homeowner made numerous improvements to bring the house into the 21st century, while preserving the integrity of the original architectural intent and honoring Wright's respect for the environment at the same time. She added bamboo floors -- a sustainable resource -- in some rooms to complement the slate floors in others. She also added Japanese shoji screens and an unusual piece of furniture that resembles a Japanese puzzle box made from a special wood and containing numerous hidden drawers and sliding doors. Entrance to the house is through the front-to-back foyer, which has a slate floor. There are different levels throughout the house. The living room is sunken and the formal dining room is elevated. Off the foyer is a large room that could be converted into the master bedroom. It has a full bath, skylights and a wall of built-in bookshelves and cabinets. The living room has a wall of fieldstone, which houses a wide fireplace, and two walls of floor-to-ceiling windows that provide views of the backyard, including several stone patios -- some lined in Belgian block -- and the in-ground swimming pool. The family room also has a wall of stone housing the second fireplace, as well as a large alcove for storage of wood, and a mirrored wall. A door in this room leads to the wood deck, which leads to a stone patio by the pool. Take three steps up from the family room into the gourmet Poggenpohl-designed kitchen. Poggenpohl kitchens are made to order and no two are alike. Its features include a center island, Silestone quartz counters, built-in bookshelves and an unusual, tall, pull-out pantry cabinet. High-end appliances include a range top and double ovens, Sub-Zero refrigerator and Miele dishwasher. Those who enjoy baking and cooking, or those who entertain frequently, take note. There is another oven in the laundry room, which also has a utility sink. In the sleeping wing of the house, which has bamboo flooring and skylights, there are three bedrooms. Two share a Jack-and-Jill-style bath. The other, the master, is en suite. One hallway has built-in shelves and closets. Another hall between the master and laundry room has a sliding door to a private wood deck. For more information or to set up an appointment to see the house, contact Robyn Crain of William Pitt Sotheby's International Realty at 203-856-5285 or email her at rbcrain@gmail.com.